Social Media can become an essential tool to augment a communication strategy. However, in order for social media to pull the weight you need, there are four steps that need to be followed. These steps include: 1) Know your consumer, 2) Set your target, 3) Execute a plan, 4) Monitor. This article will take you through each of those steps to better understand how a complete social media plan can be created. Please also download the Social Media Campaign Worksheet to gain a better understanding of what questions need to be asked at each stage. Before you can create an effective targeted campaign, you need to understand just who it is you are trying to reach. This understanding needs to extend beyond the more general demographic information (e.g. gender, age, education) in order to truly understand your targeted customers. A marketer needs to also examine more social-graphic information to understand how it is the consumer interacts with the online world. This could include information such as: which websites do they visit, how do they engage with social media, and to what extent do they interact with e-mail. In addition to this information, an effective campaign needs to center around what value the company will be bringing to the consumer. In social media, it is easy to incentivize a consumer to join a campaign (e.g. ‘like’ a Facebook group or follow a Twitter stream). However, it is much harder to get a consumer to actually engage with the campaign and remain connected. The consumer needs to see that there is value with the engagement in order for them to continue to follow the execution and becoming more invested in the campaign. What is the overarching objective that the campaign is trying to achieve? 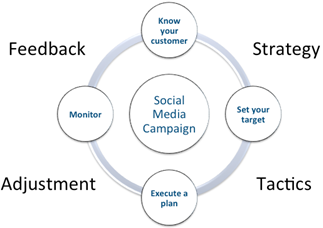 Social media does require both time and money so before considering a campaign, there needs to be a purpose in mind. An example of a desired result or objective would be to “increase sales of a new product”. From this objective, goals need to be unearthed. Goals in this case need to be SMART (Specific, Measurable, Achievable, Realistic, Time-bound). An example of a goal could be “To increase sales of the new product by 20% by next month”. Setting this goal gives you a clear idea of what to shoot for. Too often, an executive will provide direction that the company should be on a social media site (especially Facebook or Twitter). However, this may not make sense to achieve the business's objectives as stated in the previous step. A marketer needs to decide what the best tactics are to achieve the desired goal. Although a very popular website, Facebook may not be the best mechanism for ever goal or every audience. Consider the previous steps to determine what may be the most effective tactics. It is also important to consider how the tactics can work together to create a more compounding impact. Also consider the future of the campaign. Does the campaign have legs? Can it move to a new phase once this execution is completed, or is this the end? How do you know how successful you are if you don’t measure your results? If you don’t know how successful you are, how can you receive a budget for a future campaign? It is critical that the goals are tied to specific measurements. In the age of online, measurements have become much easier. There is now so much data that is available in real-time that a marketer is always kept informed. However, it is important to consider just which mechanisms are being monitored before the campaign begins. Throughout the campaign metrics need to be monitored to see if the campaign is having the desired impact. If not, the tactics may need to be rebalanced on the fly to ensure that the goals are being achieved before the campaign dollars run out. There is a reason that this diagram is created as a cycle. This is a continuous feedback loop, which relies on learnings from the past to inform the future. Social media is a new field for marketers but it still relies on the same overall knowledge. The main lesson from this article is simply, “Social media is a great tool, but spending the time to create a strategy and to monitor the campaign will increase the likelihood of success”.